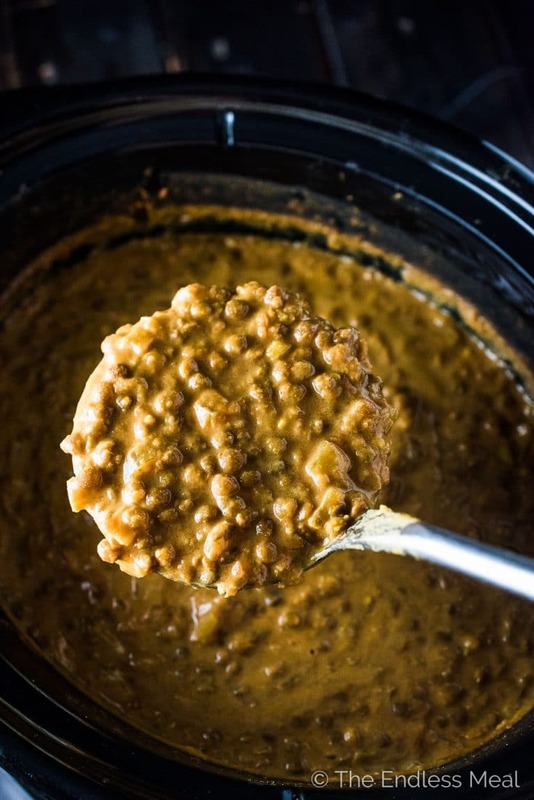 This delicious Crock Pot Coconut Lentil Curry is a slow cooker version of the most popular recipe on the blog. Throw everything into your pot, set the timer, and come home to a tasty vegetarian (and vegan!) dinner. You will LOVE it! Here it is, my friends! This is the recipe you have been asking for. This is the crock pot version of the most popular recipe on the blog. 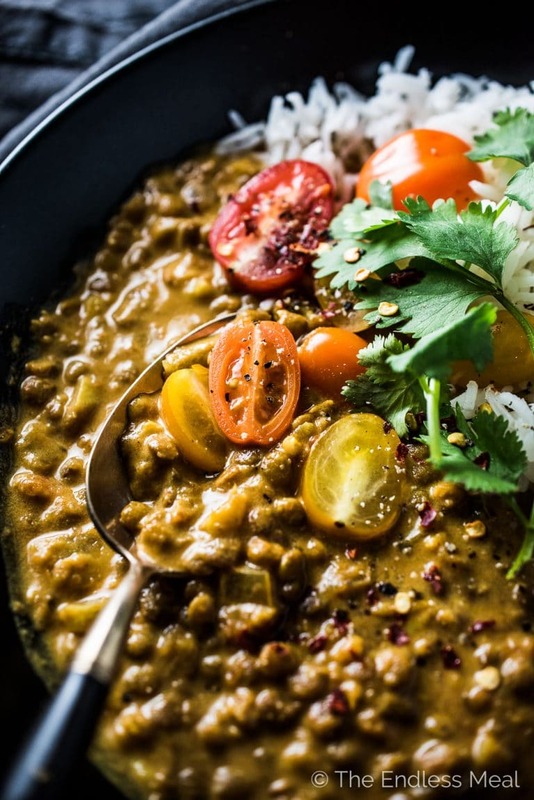 If I were the betting type (I'm totally not) I would put down money that you've tried the Creamy Coconut Lentil Curry recipe. I shared that recipe with you back in July 2016, and it quickly rose to the #1 spot. Many tens of thousands of people visit that recipe every month. It's still a go-to recipe for me at home because it is super easy to make, 100% no need to measure ingredients fail-proof, and crazy delicious. Since I published the original recipe, I've had so many requests for a Crock Pot Coconut Lentil Curry version. When you reach out to me with special requests I can't help but get a little gitty. That's what friends do; they reach out to each other. Knowing that you feel comfortable asking me for specific recipes makes me all kind of happy. This slow cooker version couldn't be any easier to make. Honestly, it almost seems too easy. ← That's the truth! I'm talking about dump all the ingredients into the pot, pop on the lid, turn it on, and walk away. Super easy. Ridiculously easy. You can even put all the ingredients in your crock pot in the evening. Store it in your fridge overnight, then turn it on in the morning before you head out the door. When you come home 8-10 hours later, dinner will be waiting for you. That's the beauty of this recipe: it cooks while you play. Or while you work, but let's not think about that. 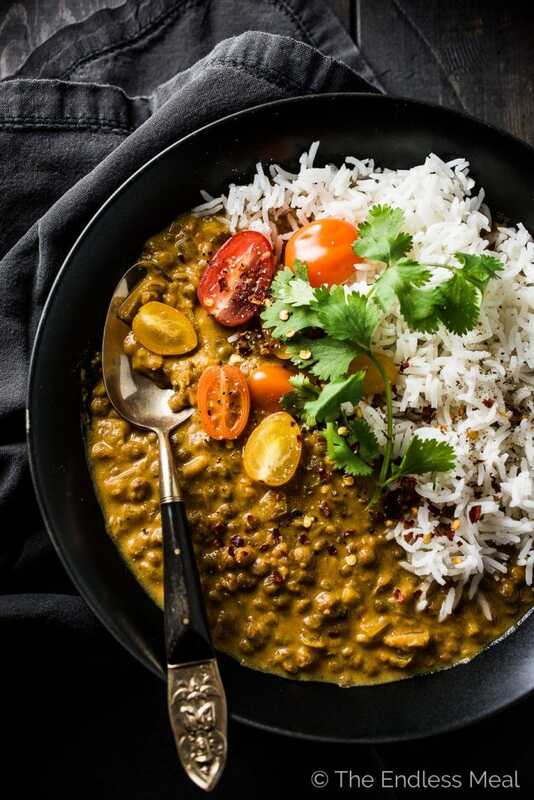 The original coconut lentil curry recipe is also easy to make, but after a long day, no cooking is better than a little cooking. That's where a bag of lentils and your slow cooker come in handy. 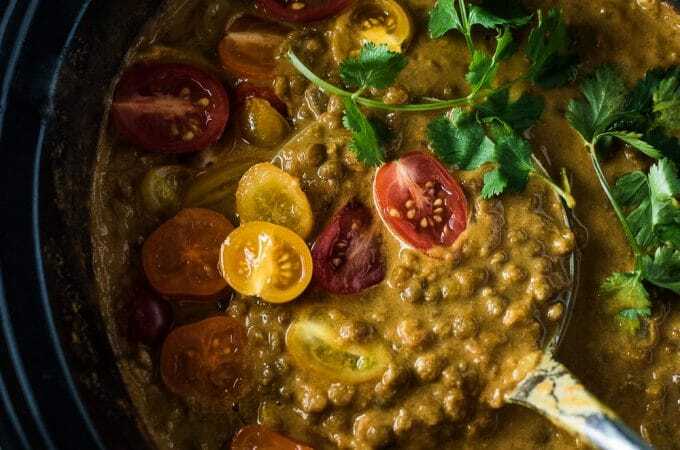 Once the lentils are cooked, all you need to do is add a can of coconut milk, a few cherry tomatoes, and a handful of cilantro and you've got dinner. If you want to get fancy, you can serve this with rice. I like it just as much on its own. Add the dried brown lentils, ginger, cumin, coriander, turmeric, if using the cayenne, crushed tomatoes, garlic, onion, and 3 cups of water in your crock pot. Put the lid on and set the timer for 4 hours on high or 8 hours on low. Stir the coconut milk, 2 teaspoons of sea salt, cilantro and cherry tomatoes into the curry. Taste and add extra salt to taste. Serve on its own or over a bed of rice. A head of garlic seems like a lot! Do you mean a clove? A head has anywhere between 6-8 cloves depending on the size. Delicious recipe! My kids and I just love this! (I use green lentils). I use 1 T curry powder, 1 tsp ginger and 2 tsp garlic instead of the other spices. A little less water also. I love this recipe! I skip the cilantro and cayenne also. Hooray! So happy it was a hit! Hi! This being both vegan and a coconut curry sold me. We actually ran out of coconut milk and tomatoes yesterday (and I didn’t feel like shopping) so I subbed flax milk and 2 Tbsp coconut oil plus 2 Tbsp tomato paste. Worked great! Silly me accidentally added the salt in the beginning but didn’t notice tough lentils, so I’ll count myself lucky this time. Served with dried coconut shavings and a squeeze of lime. Great recipe. Thank you, Kristen. Great call on the substitutions! And coconut shavings and lime sounds like the perfect toppings! Thank you so much for your recipe. I made it today using mung beans and its perfect! It has a great depth of flavour. I think it will become one of my staples. I’m so happy to hear you enjoyed the recipe! I have canned lentils on hand. Would those be okay to substitute? You would want to reduce or eliminate the water (since the canned lentils are already cooked) and simply warm them. Hi, am so making this today. If I’m using red lentils and want to cook on low, how long would you recommend? Is there any water to add to the recipe at the beginning ? Would you recommend using vegetable broth instead of water? This looks delicious and I plan on making it this weekend. Wondering if you have any suggestions for how to make it a bit more protein-rich? I was thinking about maybe adding a couple cans of chickpeas but wondering when I should add them (at the beginning or wait until the end to stir in?). Also open to any other veg-friendly protein addition suggestions. Thanks! You could absolutely add some cooked chickpeas. I would stir them in at the end with the coconut milk and simply warm them. If I want to double the receipt for a large crowd, would I double all the spices or would that be to much spice. This recipe doubles well. Simply double all of the ingredients. And use a big pot! Hello! If I am going to add bell pepper and mushrooms (and maybe spinach), when would I put them in the crock pot? You could put the peppers and mushrooms in at the beginning. I would hold off on the spinach until the lentils are cooked and simply stir it in right at the end. Lentils stayed hard! I think because of the tomatoes. Hi, one question: are the cumin and coriander ground or seeds? I just checked your stove top recipe (after I put ground in the slow cooker because the quantities seemed like a lot once I added it) and that says seeds? I hope I haven’t spoilt it by using ground? I usually use the whole seeds but ground work well, too! So excited to make this! Quick question – how large does the crock pot need to be? Mine’s a handmedown, looks like it’s about 4-5 quartz. Will this recipe fit? Thanks! If I soak the lentils ahead of time should I use less water? I’ve never tried it with soaked lentils, but I assume that they would need less water. You can always add a little in the beginning and add more if the pan looks dry. This is a great base. I subbed tomatoes for canned okra and cron I needed to use and added turkey sausage and plenty of hot sauce. We loved this recipe–all four of us, including my 7-year-old daughter. I followed it as written except that I doubled the recipe but only used ONE can of full fat coconut milk. It was perfect for us this way. We liked it even better with a little brown rice. Can’t wait to try more of your recipes! Have you ever used any legumes other than lentils with this recipe? I have a bag of dried chickpeas in the pantry and I wonder if that would work with this recipe. My daughter recently went vegetarian and I was excited to try this as an alternative to beans and pasta, and I loved that it also was cheese-free. This was so easy, so tasty, and so different from everything else I make. We had it over rice last night for dinner, and I enjoyed it by itself today for lunch. This is definitely going into the rotation! I’m so happy everyone loved it! What is a normal serving size, when you make this recipe? Hi. Just made the lentil curry. Worked out very nice. We are not vegans but eat a lot of fruit and veg. My husband loved it with potato gnocchi. Can you freeze the curry? Good call on serving it with gnocchi! And yes, it freezes beautifully! Do you think I could make this in the instant pot instead of slowcooker? I am checking the ingredients first to make sure I have everything before I start. I noticed the recipe is titled curry lentils but the ingredients states turmeric. Should I use turmeric or curry for this recipe? Thank you and I can’t wait to try this. It says cook for 4 hours. Is this on low or high? Oops I just saw 4 hours on high or 8 hours on low. I printed the recipe and it didn’t have that info on it. Hi! I will try this recipe now. Question for next time: does it make a lot of difference if I throw the coconut milk to cook with it? Making it tonight with French lentils, can’t wait to try it! Just wanting to check in the garlic quantity before I make this. When you say a head of garlic do you mean the whole bulb? I.e. many cloves? I love garlic but this seems like a lot so just wanted to check 😊. Thanks! Wonderful flavours and the finished result even looked like the photograph! I have been enjoying the feast of recipes and will be cooking more of them. I’ve made your regular version a few times before and thought I would try this one. It’s so good too! So happy you like both versions! Is the coconut milk to be used in this curry recipe… unsweetened or sweetened? Hi Kristen! This recipe is really good. I definitely recommend it with some rice. My sister-in-law said it’s her first time to eat a meatless curry dish and she never thought it would still be really satisfying even without the meat. I absolutely loved this dish! Even my meat-loving husband enjoyed it. I got a coworker hooked on it, too. The coconut milk really makes it creamy. Hard to eat only one helping! I always feel that a vegan recipe is a real winner when it’s approved by meat lovers! So happy you and your husband like the recipe!! I didn’t measure the quantity during recipe testing so I can’t say for sure. My guess would be that each serving would be about 1 1/2 cups. I hope that helps! My husband hates curry (which is almost a deal breaker I tell ya) AND I have a teeny tiny crock pot so I halved the recipe and enjoyed this all to myself. I put it over a plain baked potato and it was heavenly! Since I halved the recipe it didn’t take me as long, maybe 5 hours on low. Love it!!! I have red, yellow or green lentils – go figure 🙂 any recommendations to what would be best? Thanks! Hi: can you please explain difference between Red, Green and Brown Lentils? I can only find green lentils, would it make a big difference in the recipe? Green lentils will work well in this recipe!